Dr Tim Sharp is a world renowned clinical psychologist and father of two at the forefront of positive psychology. 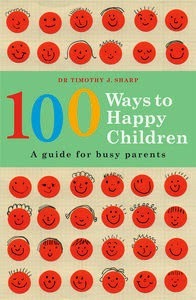 In 100 small and entertaining chapters such as foster a love of learning to building resilience, he poses his positive techniques for raising happy children.100 Ways to Happy Children: a guide for busy parents is filled with funny stories, it is a great guide for raising children. It can be read from front to back or you can randomly choose a chapter for a new insight.